Lavender is more versatile than you may know. Tanya Kern of Dancing Light Ranch makes salves and lotions from the essential oils in the flowers, which can do more for us than make us smell nice. She tells me that in addition to being a calming agent, lavender heals burns and is a powerful antiseptic. It’s mid-afternoon in July and I’m looking down the rows of light purple, transfixed on the bees bobbing and buzzing between the plants. Tanya and Don Kern are harvesting; they cut lavender and tie it in bunches. The French Gros Bleu and Grosso varieties as well as the English Royal Velvet are the top three lavenders you can find at the ranch and at their booth at the Hollywood Farmers Market. The couple is modest about what they do. “It’s really low maintenance,” Tanya tells me. After gathering information from them, though, I learn that they have deeply embedded themselves in the processes necessary to make lavender and life flourish naturally. The Kerns work calmly, free of pesticides and in tune with the cycles of nature. Their lavender is not organically certified, but it’s truly natural. They don’t use sprays, which means that there is a lot of weeding involved in the care of the plants. Tanya points out that people often forget the importance of not using pesticides with lavender because they aren’t always consuming it. In addition to general concern for the Earth, it’s important not to contaminate lavender with sprays because it’s going under people’s pillows and being made into salves and lotions that they rub all over their bodies. In addition to being pesticide free, the Kerns also collect rainwater which they use to water the lavender, their garden and for all the animals in their care; including Dancing Light, the horse that bears the ranch’s namesake and the numerous dogs that can be seen running around. Tanya and Don have a small garden, complete with a Cascadia flag. I’m happy they are dedicated to our bioregion. 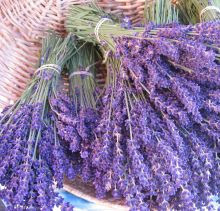 Early summer is the time for fresh lavender, but you’ll be able to get dried lavender all year round. Don tells me that it keeps its scent for six months after it has been picked and shows me how to release the aroma by pressing one small bud between the thumb and forefinger. It’s pungent.